Todays sightings included; 3 Hen Harrier, single Merlin and Peregrine, 38 Purple Sandpiper, 2 Woodcock, 4 Waxwing, 1 Robin, 23 Fieldfare, 1 Song Thrush, 20 Redwing, 2 Chiffchaff, 5 Brambling and 5 Mealy Redpoll. 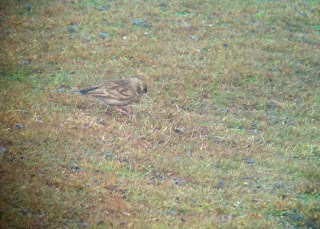 Torrential rain all day hampered sightings a bit but we did manage to see; a Sparrowhawk, a Water Rail, a Woodcock, 4 Waxwing, 1 Blackcap, 2 Chiffchaff and 4 Mealy Redpoll. A male Hen Harrier, 5 Waxwing, 2 Robin, 14 Blackbird, 12 Redwing, single Blackcap and Chiffchaff, a Goldfinch and 15 Mealy Redpoll were seen. 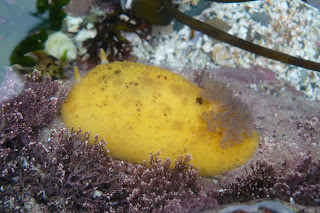 On the non-avian front a Sea-lemon ( Archidoris pseudoargus ) was found. 2 pale-bellied Brent Geese were seen and good counts of 20 Gadwall and 19 Tufted Duck were returned. 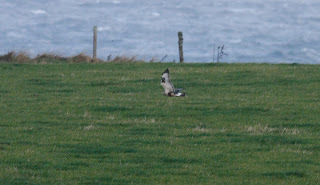 A single Black-tailed Godwit was quite late and 2 Little Auk flew past the north end. 81 Meadow and 16 Rock Pipit were counted, 15 Waxwing ( of which 11 were ringed ) and a Black Redstart were seen. 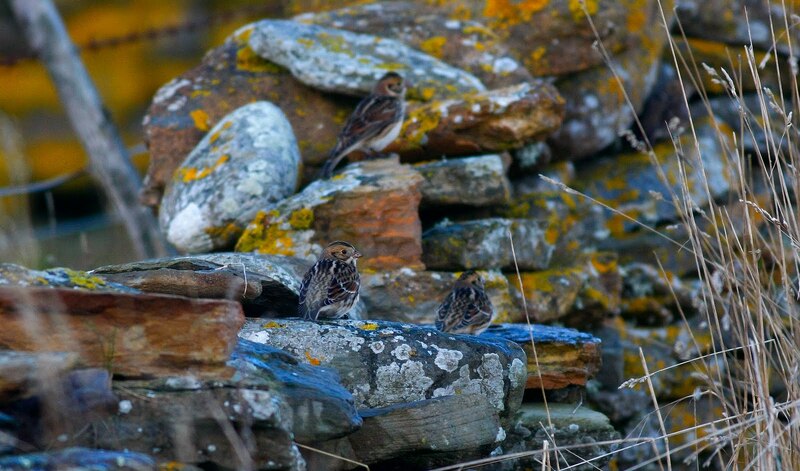 14 Lapland Bunting and 90 Snow Bunting ( 4 were trapped ) were seen. A Peregrine was seen today along with a Waxwing, 2 Blackcap, 1 Chiffchaff and a Mealy and a Greenland Redpoll. Very little around still, the highlights being a ring-tail Hen Harrier, 2 Blackcap and 22 Twite. A four hour seawatch in the morning produced 372 Fulmar, 19 Sooty Shearwater, 1 Manx Shearwater, 437 Gannet, 5 Long-tailed Duck, 4 Great Skua, 751 Kittiwake, 9 Little Auk and 90 Auk sp. Away from the sea there was a juvenile Glaucous Gull, a Dunnock and 3 Blackcaps. A pretty quiet day; 123 Wigeon werecounted as were 104 Sanderling,37 Purple Sandpiper, 45 Dunlin, 5 Common Redpoll and 222 Snow Bunting. 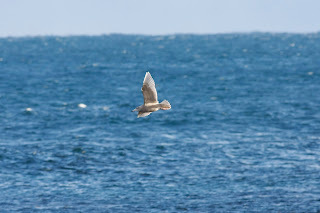 2 Sooty Shearwaters were the only thing of note on a seawatch. 7 Whooper Swan were the highest count so far and the best of the ducks were 3 Long-tailed Duck and 10 Red-breasted Merganser. An adult Iceland and a juvenile Glaucous Gull were seen, a Waxwing was outside the observatory and a Mistle Thrush was at the north end. 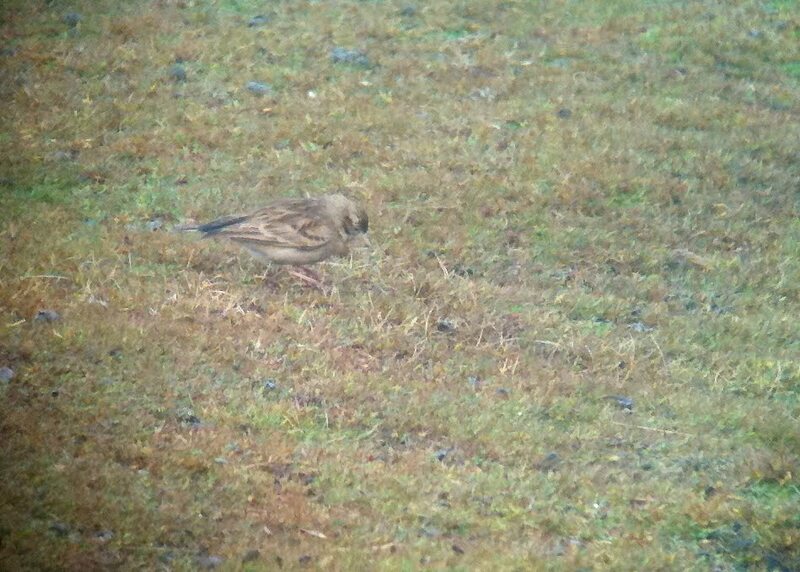 13 Mealy Redpoll were near Kirbest, 102 Lapland Bunting and an impressive 668 Snow Bunting were counted. 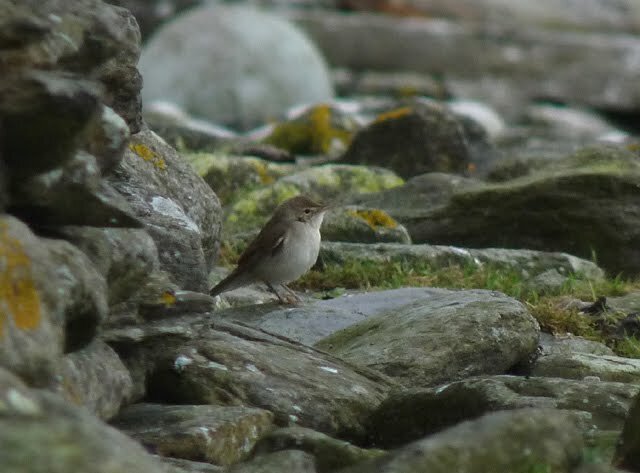 A late Arctic Skua and a late Tree Pipit were seen today. Other passerines of any note were; single Robin and Whinchat, 30 Blackbird, 1 Fieldfare, 2 Song Thrush, 12 Redwing, 3 Blackcap, 2 Chiffchaff, 47 Lapland Bunting and 144 Snow Bunting. 6 Red-throated and 3 Great Nothern Diver were an increase on recent numbers while 14 Long-tailed Duck and 3 Common Scoter were on the sea. Another Rough-legged Buzzard flew south through the island at 1045 and a juvenile Iceland Gull was at Bewan. A Short-toed Lark was near Neven and finches included 41 Brambling and 30 Common Redpoll. 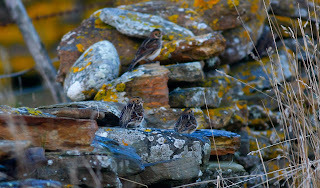 52 Lapland Bunting were around the island and an impressive count of 454 Snow Bunting was made. A hours seawatch in the afternoon produced 82 Sooty Shearwater, Tufted Duck had increased to 11. A Rough-legged Buzzard flew south at 1310; was it the bird that we believe roosted on the island last night? A Little Gull was near Westness, a Woodpigeon was seen and a Richards Pipit was behind the surgery. 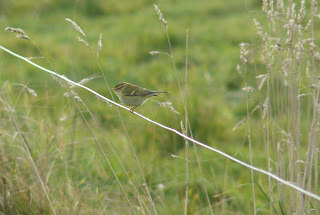 The only warblers were 3 Blackcap and a Mistle Thrush was seen. The main interest today came from seawatching, two hours in the morning and one in the afternoon produced combined totals of 1251 Fulmar, 41 Sooty Shearwater, 253 Gannet, 7 Great Skua, 152 Kittiwake and undoubtably the bird of the day a FEA'S PETREL that flew past on a seawatch at 1140. Raptors were represented by singles of Merlin , Peregrine and 2 Rough-legged Buzzards, the Whimbrel was still around and a Little Stint was at Westness. Atleast 11 Waxwing were flying around today while other passerines included 2 Dunnock, 6 Robin, a Black Redstart, a Lesser Whitethroat, 9 Blackcap, 3 Chiffchaff, 35 Twite, 26 Mealy Redpoll, 109 Lapland Bunting and 28 Snow Bunting. A Slavonian Grebe was on Hooking Loch; also today there were 141 Greylag Geese, 90 Dunlin, 1 Ruff, a late Whimbrel, 47 Redwing, 1 Garden Warbler, 3 Blackcap, 2 Chiffchaff, 44 Lapland Bunting and 108 Snow Bunting. The eclipse drake King Eider was seen again today, this time off Dennis Head. Apart from that there was not much else; a Goldeneye on Gretchen was the first of the autumn, the Stock Dove was still around, 5 Blackcaps, a single Chiffchaff, a Spotted Flycatcher, 23 Brambling, 10 Twite and 60 Snow Bunting were the best of the rest. Bird of the day today was an eclipse drake King Eider that was seen by one person at Stromness point, despite extensive searching we could not relocate it. 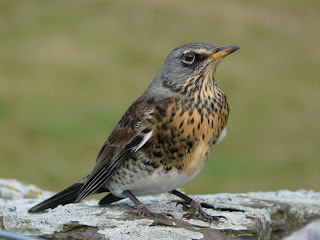 A Turtle Dove was seen and counts of 41 Robin, 25 Wheatear, 14 Fieldfare, 29 Song Thrush and 57 Redwing were returned. 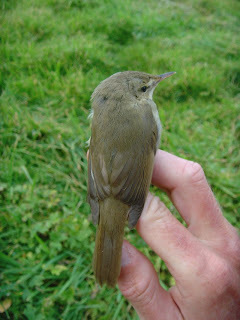 The Pied Wheatear was still at the Lurn but warblers had decreased to just a single Blackcap and 3 Chiffchaff. A Red-backed Shrike was at the Obs and a Great Grey Shrike was at Holland. 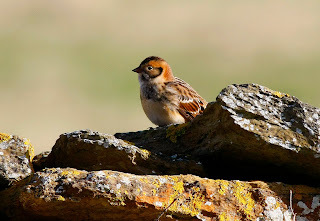 43 Lapland Bunting and 149 Snow Bunting were counted. Things have quietened down a bit with numbers of most migrants decreasing daily. A Stock Dove was seen which is a good island record, numbers of other migrants included 113 Meadow Pipit, 25 Robin, the Pied Wheatear (by common consensus ), 5 Wheatear, 16 Song Thrush, 63 Redwing, 1 Lesser Whitethroat, 3 Blackcap, 13 Chiffchaff, 6 Goldcrest, 1 Spotted Flycatcher, 20 Chaffinch, 28 Brambling and 16 Twite. Lapland Buntings had increased to 151 and a count of 28 Reed Bunting is quite high for the island. Todays counts were pretty simillar to yesterdays indicating that not much turnover was going on. There were 241 Meadow Pipit, 26 Rock Pipit, 9 Dunnock, 64 Robin, 1 Black Redstart, 1 Redstart, 18 Wheatear, the Pied/ Eastern Black-eared Wheatear, 1 Ring Ouzel, 27 Blackbirds, 42 Song Thrush, 113 Redwing, 1 Mistle Thrush, 1 Barred Warbler trapped, 3 Garden Warbler, 21 Blackcap, 3 Yellow-browed Warbler, 18 Chiffchaff, 64 Goldcrest, a new Great Grey Shrike trapped and 3 Greenfinches. An arrival of birds first thing in the morning produced good numbers of thrushes and a few other things. There were 2 Kestrel, 10 Jack Snipe and a Woodcock. Passerine migrants consisted of 1 Grey Wagtail, 8 Dunnock, 138 Robin, 2 Redstart, 2 Whinchat, 38 Wheatear, 7 Ring Ouzel, 178 Blackbird, 24 Fieldfare, 200 Song Thrush, 2665 Redwing, 1 Reed Warbler, 1 Barred Warbler, 1 Lesser Whitethroat, 2 Garden Warbler, 25 Blackcap, 4 Yellow-browed Warbler, 41 Chiffchaff, 3 Willow Warbler, 246 Goldcrest, 1 Spotted Flycatcher, 1 Red-breasted Flycatcher, 2 Pied Flycatcher, an adult Great Grey Shrike, 53 Chaffinch, 80 Brambling, 1 Goldfinch, 51 Siskin, 8 Common Redpoll and a Common Rosefinch. On the 8th the Brent Goose was still around and 5 Jack Snipe and a Greenshank was seen. 5 Swallow were late and good counts of 485 Meadow and 27 Rock Pipit were recorded. A Dunnock,16 Robin, single Redstart, 3 Whinchat and 51 Wheatear were recorded and thrush numbers consisted of 45 Blackbird, 48 Song Thrush and 250 Redwing. Warbler numbers were 1 Garden, 13 Blackcap, 13 Chiffchaff, 1 Yellow-browed, 3 Willow and 40 Goldcrest. 2 Spotted and 2 Red-breasted Flycatchers were seen the Rose-coloured Starling was still around and a Goldfinch was seen. 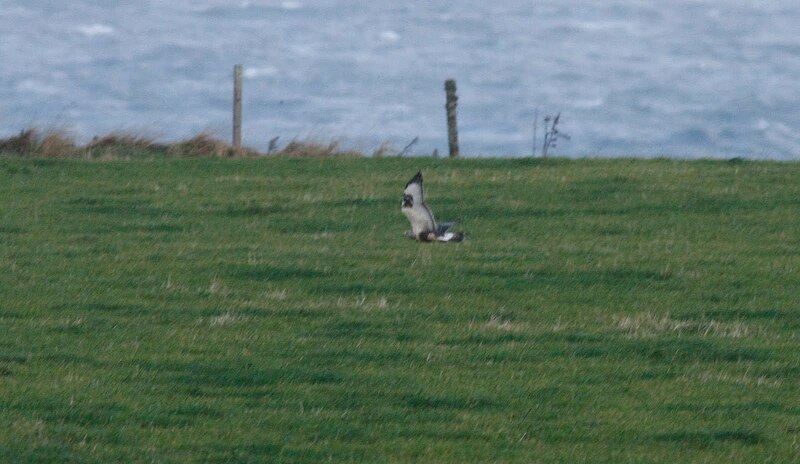 On the 6th a pale-bellied Brent was found and 4 Jack Snipe were flushed from various areas. 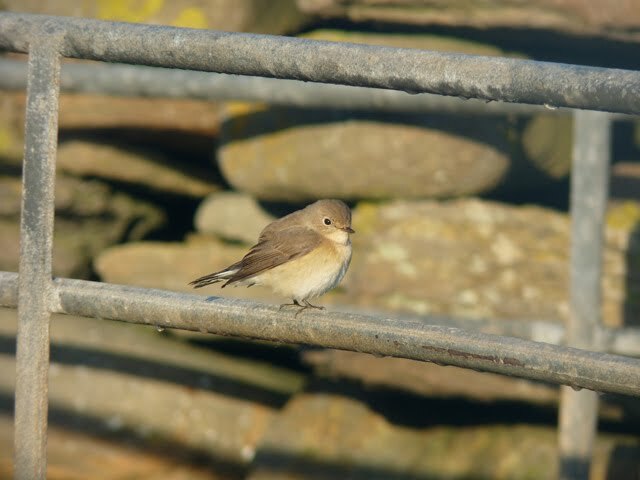 Passerine migrants included the first Dunnock of the autumn, 6 Robin, 1 Redstart, 29 Wheatear, 97 Song Thrush, 2 Grasshopper Warblers, 8 Blackcap and an adult female Red-breasted Flycatcher. The 7th saw 313 Pink-footed Geese fly south, 102 Dunlin was a good recent count and passerine migrants included a Tree Pipit, 501 Meadow Pipit, 41 Rock Pipit, 9 Robin, 34 Wheatear, 1 Grasshopper Warbler, 1 Reed Warbler, the adult Red-breasted Flycatcher was still in Holland and a first year bird was found near the Lighthouse. The Rose-coloured Starling was present on both days. Things are still very quiet with nothing new happening at the moment. 85 Grey-lag Geese were seen heading south and the Turtle Dove is still hanging around. 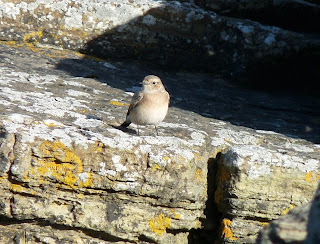 There were 3 Robin, 1 Redstart, 2 Whinchat and 21 Wheatear. 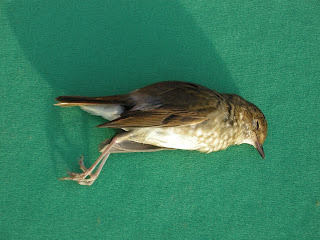 Thrushes consisted of 2 Ring Ouzel, 36 Blackbird, 62 Song Thrush and 4 Redwing. 3 Blackcap, 2 Garden Warbler and 2 Chiffchaff were the only warblers seen while finches included 180 Siskin, 34 Chaffinch and 19 Brambling. The only scarcity/rarity was the juvenile Rose-coloured Starling. A very quiet day that didn't produce much; a House Martin was new and hanging on were 6 Robin, 3 Redstart, 2 Whinchat, the Mistle Thrush, 2 Grasshopper Warbler, 8 Blackcap, 2 Yellow-browed Warbler, 4 Chiffchaff, 4 Goldcrest and a Spotted Flycatcher. Generally a bit quieter today though there are still reasonable numbers of finches and Song Thrushes around. The Quail, a Richards Pipit and the juvenile Rose-coloured Starling were seen again as well as a Tree Pipit and 3 Yellow-browed Warblers. Mark Warren strode out this morning and the first thing he found was a RUFOUS-TAILED ROBIN, a 2nd for Britian, unfortunately it was dead. How unlucky is that. Other birds of note today included, a Corncrake, a Quail, 2 Richards Pipits, 2 Barred Warblers, a juvenile Rose-coloured Starling, a Common Rosefinch, 2 Grasshopper Warblers and 2 Little Gulls. A bright if windy morning deteriorated into a pouring storm late afternoon. Most of the interesting stuff today was passerines with counts of 14 Robin, 6 Redstart, 2 Whinchat, 29 Wheatear, 6 Ring Ouzel, 43 Blackbirds, 1 Fieldfare, 66 Song Thrush, 16 Redwing, 1 Mistle Thrush, 1 Reed Warbler, 1 Barred Warbler, 1 Lesser Whitethroat, 2 Garden Warbler, 9 Blackcap, 1 Yellow-browed Warbler, 4 Chiffchaff, 2 Willow Warbler, 10 Goldcrest, 1 Spotted Flycatcher, 1 Red-breasted Flycatcher, 133 Brambling , 115 Siskin, 43 Lapland Bunting and 103 Snow Bunting. The best though was another Blyth's Reed Warbler found near nether linnay by once again Rory Tallack; two in two days thats not bad going. On a very pleasant day weather wise, birding was a joy which is shown in some of the totals we got. A male Hen Harrier was seen and the best of the waders was, 3 Curlew Sandpiper, 2 Jack and 568 Common Snipe and a Woodcock. Single Woodpigeon and Turtle Dove were seen, the Richard's Pipit was still around and a Flava Wagtail and a Grey Wagtail were recorded. 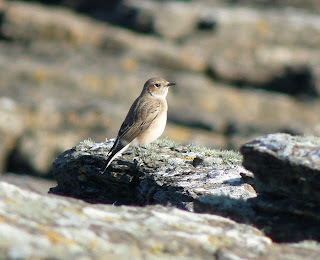 17 Robin, a Bluethroat at quoybanks, 3 Redstart, 4 Whinchat and 28 Wheatear were seen. Thrushes consisted of 2 Ring Ouzel, 40 Blackbird ( including a Norwegian control ), a Fieldfare, 105 Song Thrush and 23 Redwing. Warblers put in a better showing with 2 Grasshopper, 2 Reed, a Barred, a Lesser Whitethroat, 5 Garden, 10 Blackcap, 7 Yellow-browed, 7 Chiffchaff ( 1 Tristis type ), 5 Willow, 16 Goldcrest and best of all a Blyth's Reed was found late in the day by Rory Tallack at inglis geo which was trapped and ringed. Finch numbers remained good with 50 Chaffinch, 112 Brambling, 161 Siskin, 3 Rostrata Redpoll, 1 Lesser Redpoll and a Hawfinch. 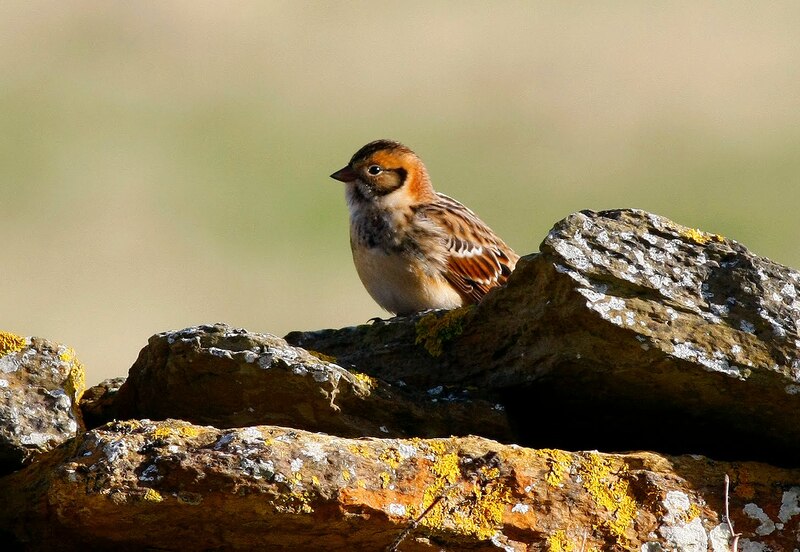 There were 146 Lapland Bunting and an impressive count of 242 Snow Bunting. A fine morning soon deteriorated into a very wet afternoon. Birds of note included 18 Barnacle Geese, 7 Jack Snipe, the first Woodcock of the autumn and single Stock Dove and Woodpigeon. 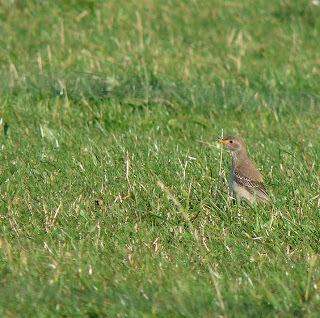 A Short-toed Lark was found late on at west beach and the Richards Pipit was still om sandar. 16 Robin, 5 Redstart, a single Whinchat and 14 Wheatear were the chat counts while thrush numbers increased with 3 Ring Ouzel, 50 Blackbirds, 99 Song Thrush and 7 Redwing. Warbler numbers were still low with just singles of Lesser Whitethroat, Garden and Willow Warbler with 8 Chiffchaff, 2 Yellow-browed and 15 Goldcrest. Finch numbers increased to 11 Chaffinch, 56 Brambling, 36 Siskin and singles of northwestern Redpoll and Common Rosefinch. 118 Lapland and 63 Snow Bunting were counted.